Cheerleading Coaches will receive a TEMPORARY email link ( expires 48hours after being sent) to access specific league resources on their smart phones and/or tablets upon completion of their application, background check, mandatory training, team assignments, etc. that confirms their approval. The App works on both iPhones/iPad and Android phones and is available in your App Store or Google Play account. 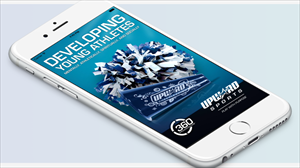 WHEN YOUR LEAGUE DIRECTOR APPROVES YOU FOR ACCESS, YOU WILL RECEIVE AN E-MAIL FROM UPWARD SPORTS WITH A LINK CONNECTING YOUR IPHONE/IPAD OR ANDROID DEVICE TO TEAM DATA SPECIFIC TO THE ROSTER OF PARTICIPANTS YOU HAVE BEEN ASSIGNED. FOR SECURITY REASONS, THE LINK WILL EXPIRE IF NOT ACTIVATED AND YOUR EMAIL SOFTWARE MAY PLACE IT IN A FOLDER OTHER THAN YOUR INBOX ( i.e. PROMOTION, JUNK, SCAM, ETC.). THE LINK IS ONLY ENTERED ONCE TO SYNC YOUR PHONE WITH YOUR ROLE or TEAM SPECIFIC RELATED INFORMATION ON YOUR INITIAL CONNECTION. YOUR CONNECTION WILL EXPIRE AT THE END OF EACH BASKETBALL SEASON OR IF DEACTIVATED BY SYSTEM ADMINISTRATOR. BE SURE TO REFRESH FREQUENTLY TO SEE UPDATES FROM THE MASTER DATABASES.